Problem: digital copyright enforcement has been pursued by a number of measures, one of which is "Digital Rights Management" (DRM). This term encompasses technological locks and additional hidden codes and encryption methods that make a user's ability to access movies, books, music, etc. dependent on the copyright holders' agreement with the hardware manufacturers. For example, while you are free to highlight and scribble notes on a book, you may not have this ability if you are reading an e-book on a kindle or ipad due to the publisher's DRM agreement with the e-reader. While you may have been able to fast-forward though trailers on a VHS, a DVD might be locked using DRM not to let you view the movie without viewing the trailers. And, while you were able to record from the radio onto a mix-tape, digital music files might be encrypted through DRM to forbid any copies from being made. Because DRM is designed to constrain a range of uses of digital media, it curtails a user's freedom; this is why the Free Software Foundation contends DRM is "defective by design": because it superimposes the defense of copyright against other fair-use rights and archiving uses through a technological method that cannot distinguish between unlawful and lawful transformative uses. Purpose of Defective by Design: the campaign seeks to eliminate DRM technologies from being used. DRM is seen as a threat to media innovation, breaching user's privacy to monitor their use of protected content, and encumbering computer users' "freedom to tinker" with their own property, giving users back power to dispose of their hardware, software, and data the way each person sees fit. Their campaign involves "identifying and targeting defective products, pressuring media retailers and hardware manufacturers to stop supporting DRM, exposing the immense concentration of power over media created by DRM, and raising awareness of DRM to libraries, schools, and individuals around the world." February 06, 2006 obtained 4565 signatories who promised to boycott music from CDs that used DRM. Later on protests in Seattle at the at WinHEC. where participants wore hazmat suits targeted Windows DRM, and the method for protesting using this visual tool was adopted from here on out. 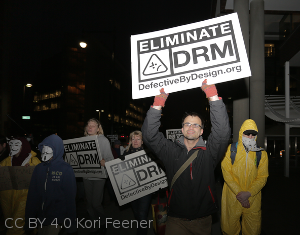 Defective By Design declared October 3rd 2006 as international "Day Against DRM". The campaign registered over 10,000 registrants and 200 different actions. In 2016 the day was moved to May 3rd. In other years it has been celebrated on May 4th, or a 35-day period (2008). For their tenth anniversary of their campaign documented a timeline with their victories and shortcomings. The campaign was launched by the Free Software Foundation, a non-for-profit organization that wants to increase transparency in coding and control over technology, as well as to decrease corporate and government surveillance by supporting the use of "free software". Free software is defined as software you are "freedom to share, study and modify it", sometimes termed "free as in speech, not as in beer". The Free Software Foundation is funded through donations and associate membership dues. Based in Boston, MA, USA, the foundation turned 30 in 2016, 7.5% of their funding goes to fundraising, 13.1% to administrative work, and 79.4% is allocated to programs, including the Defective by Design campaign. Defective by Design targets media companies, software and hardware manufacturers (DVDs and CDs) by facilitating public awareness of the issue and harnessing their outrage to pressure the aforementioned companies and manufacturers. Past targets have included Microsoft's software and its music player Zune, Apple-- including Steve Jobs specifically--U2's vocalist, Bono, executives from intellectual property-defense groups from the US (RIAA), France (SNEP), Canada (CRIA), Germany (IFPI) and the UK (BPI), a boycott on Sony, protesting against the World Wide Web Consortium (W3C)' development of the Encrypted Media Extensions (EME and position letter against it), a letter to Firefox for supporting EME and a letter to the European Commission asking them to oppose EME. Defective by Design is currently asking supporters to boycott Netflix by cancelling their account because of their support for EME and DRM locks. Other ongoing campaigns include taking a selfie and signing a letter to the W3C offices against their proposal do adopt EME's in new internet standards. The campaign suggests issues, companies, people, and actions like petition and letter signing, boycotts and protesting using flash mobs but they also encourages decentralized protesting and shares supporters' efforts on their Twitter and Updates section. Their campaign has been characterized as having introduced "a degree of activism previously unknown in the FOSS [Free and open-source software]communities", according to Linux Journal writer Bruce Byfield. Defective by Design has assisted in organizing targeted efforts against specific pieces of software and hardware. While DRM is still used in some products, like DVD's, it is widely shunned in others, like digital music. For example, in 2008 it encouraged targeting the Electronic Arts game company through Amazon's tagging function (now defunct) against the game Spore. Defective by Design considers iTunes dropping their support for DRM in music in 2009 as a win for their campaign, which was tied to changing Bono's support for it since 2006, as well as the failure of Window Zunes to stay on the market. Defective by Design also received what it considered to be positive feedback from record-industry executives when it launched a campaign to directly contact them. It has also attempted to engage with policy makers but has had difficulties getting their voices heard. Defective by Default has continued to challenge DRMs by looking forward to the new way these standards are being adopted in new technologies (like the web's switch to HTML 5). However, analysis of their material seems to convey that the campaign draws from within its own community, given the level of sophistication of the literature explaining why DRM is harmful and the way's it's implemented. For example, many internet users are familiar with Netflix but outside the free software community not most might be able to understand why it's support of EME's should warrant boycott. Defective by Design could increase its impact by making the issue of DRM more comprehensible to technology consumers, not just developers. Because so far markets have shunned walled gardens like the Zune's music environment, Defective by Design could ride the wave of interoperability to engage with those outside its core public. The organization is also open to engaging with those who disagree with DRM and may not be affiliated with them directly, like librarians and individual users, which is a positive step in growing their activist network. The campaign's contact us is e-mail-responsive.